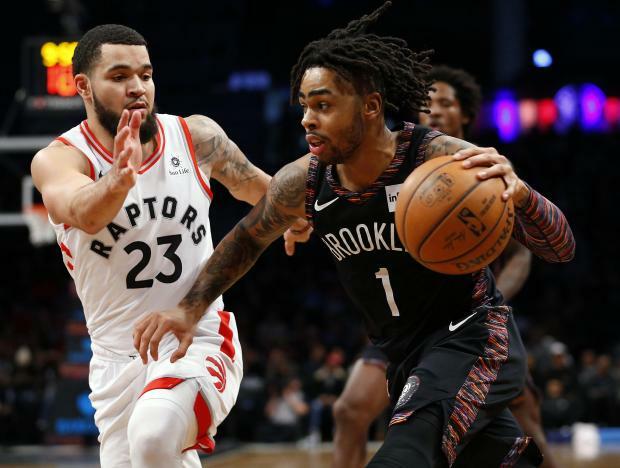 Jarrett Allen hit the go-ahead layup with 64 seconds left in overtime, and the Brooklyn Nets outlasted the Toronto Raptors for a 106-105 victory Friday night in New York, ending a pair of eight-game losing streaks. Allen helped the Nets end an eight-game home losing streak and an eight-game overall skid when he converted a reverse layup after getting the pass from Spencer Dinwiddie. The Nets then exhaled as Kyle Lowry missed a left-wing 3-point attempt with 49 seconds left and Fred VanVleet missed a 3-point shot right before the final buzzer. D'Angelo Russell led the Nets with 29 points and hit three jumpers in overtime after sitting down the stretch in the fourth quarter. Kawhi Leonard led all scorers with 32 points and blocked Dinwiddie's layup with one second left in the fourth quarter to ensure overtime. DeMar DeRozan recorded 36 points, nine assists and eight rebounds to lead San Antonio to a victory over visiting Los Angeles. LaMarcus Aldridge and Jakob Poeltl each had 14 points and eight rebounds for the Spurs, who avenged a Wednesday loss to the Lakers in L.A.
Patty Mills also scored 14 points for San Antonio, and Davis Bertans added 13. Bryn Forbes and Marco Belinelli contributed 11 points apiece and Rudy Gay added 10 for San Antonio, which outscored Los Angeles 44-21 in the fourth quarter. LeBron James had 35 points, 11 assists and eight rebounds, and Kyle Kuzma added 27 points and eight rebounds for the Lakers, who had a four-game winning streak halted. Lonzo Ball registered 13 points and 11 assists. Golden State earned a measure of revenge against host Milwaukee, reversing an earlier blowout loss. Stephen Curry and Klay Thompson shared game-high scoring honors for the Warriors with 20 points apiece, each hitting four 3-pointers. Kevin Durant was held to 11 points on 3-for-14 shooting, so the Warriors turned to their depth to complete a 3-2 trip with a third straight win. Jonas Jerebko, Andre Iguodala and Alfonzo McKinnie combined for 10 3-pointers as the Warriors drained 19 from beyond the arc and outscored the Bucks 57-21 on threes. Giannis Antetokounmpo had 22 points and a game-high 15 rebounds for the Bucks, who won 134-111 at Golden State last month. Lauri Markkanen scored 24 points, including a tiebreaking layup with 4.9 seconds remaining, to lift host Chicago over Oklahoma City despite another triple-double from the Thunder's Russell Westbrook. Zach LaVine finished with a team-high 25 points for the Bulls, and Justin Holiday contributed 20. Chicago snapped a seven-game losing streak and gave Jim Boylen his first win as a head coach four days after he replaced Fred Hoiberg. Westbrook had 24 points, 17 rebounds and 13 assists in 35 minutes. He also committed 10 turnovers. Westbrook posted his second triple-double in a row, his fifth of the season and the 109th of his career. Jimmy Butler poured in 38 points for the second consecutive game, and Philadelphia overcame the absence of All-Star center Joel Embiid to rally past host Detroit. The Sixers' Ben Simmons piled up 18 points, 14 rebounds and six assists while JJ Redick had 18 points and five assists. Embiid was rested by Philadelphia coach Brett Brown after a lethargic performance Wednesday in a loss at Toronto. Blake Griffin racked up 31 points, 12 rebounds and six assists to lead Detroit, which has lost three straight. Andre Drummond contributed 21 points and 10 rebounds. De'Aaron Fox missed his career high by one point, pouring in 30 points as Sacramento rolled to a win at Cleveland. Buddy Hield complemented his backcourt mate with 25 points for the Kings, who won their third straight, their second in a row to start a four-game trip. Jordan Clarkson had 26 points and rookie Collin Sexton 23 for the Cavaliers, who played without George Hill, who was held out as final details were being worked out on a trade to Milwaukee. Kemba Walker scored 21 points and hit four free throws in the final 15 seconds as Charlotte snapped a three-game losing streak with a victory over Denver. The Hornets exploded for a 40-point second quarter and led by as many as 16 in the first half, then pulled away in the fourth quarter after the Nuggets got as close as one point late in the third period. In the process, the Hornets snapped the Nuggets' seven-game winning streak. JaMychal Green scored a team-high 24 points to lead a strong bench effort for visiting Memphis to a win at New Orleans. Kyle Anderson added 19 points and 11 rebounds, Marc Gasol scored 15 and Joakim Noah came off the bench to contribute 13 for the Grizzlies. Memphis' reserves outscored their Pelicans counterparts 53-11. Julius Randle led the Pelicans with 26 points and 13 rebounds, but he missed two important free throws late as New Orleans scored its last field goal with 5:18 remaining. Anthony Davis added 25 points and 11 rebounds, Jrue Holiday had 20 points and 11 assists, and Solomon Hill scored a season-high 14 for the Pelicans. Fill-in starter Bam Adebayo scored 20 of his game-high 22 points in the first half and added 10 rebounds, leading Miami over host Phoenix. Miami reserve Justise Winslow added 20 points on 7-of-8 shooting, including 4-of-4 on 3-point attempts. Winslow also grabbed eight rebounds and handed out six assists. Phoenix's De'Anthony Melton, a 20-year-old rookie and a 2018 second-round pick, made his first career start, posting 12 points and four assists. The Suns started two other rookies: center Deandre Ayton (16 points) and Mikal Bridges (12). Bojan Bogdanovic scored 26 points, and visiting Indiana cruised to an easy win over Orlando. Cory Joseph scored 15 points off the bench, and Thaddeus Young added 14 points and seven rebounds for the Pacers. The win was Indiana's eighth straight against Orlando and the 15th in the past 16 meetings. Nikola Vucevic had 22 points and 10 rebounds, and Aaron Gordon added 20 points and 14 rebounds for Orlando. The Magic have lost four of their past six games.